The HD DVD vs. Blue-Ray high-definition DVD format war is over. In case you missed it, Toshiba made a statement saying, "it will no longer develop, manufacture and market HD DVD players and recorders." As a result, Amazon and other online retailers have been having a fire sale trying to offload the Toshiba HD DVD players. You can pick one up for $79 or less. In a further humiliation, according to TechRadar.com, instead of being listed as HD DVD players, they are now being displayed as upscaling DVD players. You know, the ability to "upscale" standard DVDs to higher resolution - albeit not as good as HD DVD resolution, err. I mean Blue-ray resolution. After all, HD DVD is now dead. The biggest winner in all this is obviously Sony. The biggest loser in the consumer. While standardizing on a single standard is good for the consumer, Toshiba's HD DVD format and the HD DVD players have been consistently much cheaper than Blue-ray players - $150 vs. $400. Consumers have been slow to adopt HD players not only because of the preceding format war, but also because of the expensive price-tag. Toshiba saw a surge of consumers buying their HD DVD players over the Christmas season because they dropped the price-tag. Sony has stuck to their guns by continuing to offer standalone Blue-ray players for a whopping $400. I expect consumers to not rapidly adopt Blue-ray players unless Sony drops the price to less than $300. Even $299 might get more consumers to bite. I will say this though - you can buy a Blue-ray DVD player included within a Sony PlayStation 3 also for $400. If I do buy a Blue-ray player I might just buy a Sony PlayStation 3 instead since it's the same price as a standalone player and you get a ton more features, including obviously video games. So the second biggest loser in all this might just be Microsoft and their XBox 360 console. I expect there will be a lot of consumers like me that aren't heavy gamers but will buy a PlayStation 3 just to get the Blue-ray DVD player. No wonder Sony isn't lowering their price - their trying to shuffle people into buying a PS3. Oh and if you want to see the most popular / best selling Blue-ray movies, check this out. 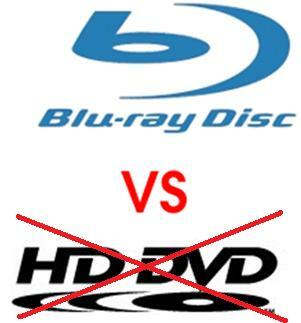 The HD DVD vs. Blue-Ray high-definition DVD format war is over. In case you missed it, Toshiba made a statement saying, \"it will no longer develop, manufacture and market HD DVD players and recorders.\" As a result, Amazon and other online retailers have been having a fire sale trying to offload the Toshiba HD DVD players. You can pick one up for \$79 or less. In a further humiliation, according to TechRadar.com, instead of being listed as HD DVD players, they are now being displayed as upscaling DVD players. You know, the ability to \"upscale\" standard DVDs to higher resolution - albeit not as good as HD DVD resolution, err. I mean Blue-ray resolution. After all, HD DVD is now dead. The biggest winner in all this is obviously Sony. The biggest loser in the consumer. While standardizing on a single standard is good for the consumer, Toshiba's HD DVD format and the HD DVD players have been consistently much cheaper than Blue-ray players - \$150 vs. \$400. Consumers have been slow to adopt HD players not only because of the preceding format war, but also because of the expensive price-tag. Toshiba saw a surge of consumers buying their HD DVD players over the Christmas season because they dropped the price-tag. Sony has stuck to their guns by continuing to offer standalone Blue-ray players for a whopping \$400. I expect consumers to not rapidly adopt Blue-ray players unless Sony drops the price to less than \$300. Even \$299 might get more consumers to bite. I will say this though - you can buy a Blue-ray DVD player included within a Sony PlayStation 3 also for \$400. If I do buy a Blue-ray player I might just buy a Sony PlayStation 3 instead since it's the same price as a standalone player and you get a ton more features, including obviously video games. So the second biggest loser in all this might just be Microsoft and their XBox 360 console. I expect there will be a lot of consumers like me that aren't heavy gamers but will buy a PlayStation 3 just to get the Blue-ray DVD player. No wonder Sony isn't lowering their price - their trying to shuffle people into buying a PS3.